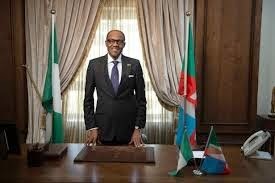 I will love to first of all say A BIG CONGRATULATIONS TO MY DEAR COUNTRY NIGERIA'S PRESIDENT ELECT MUHAMMADU BUHARI!!! You Sir, have indeed fought a good fight. 1) With your journey to be Nigeria's President again, you have thought me, never ever to give up. Trials, failures and disappointments might come, but one thing for sure, if I keep fighting, if I keep my head above the water, I will laugh again, victory will be mine. I will have a glorious win. The fight will all be worth it in the end. 2) You thought me to always be true to myself. Always go with one thing wherever I find myself and never leave this thing behind, my character. Thank You Lord For Our New President. We Ask That You Lead Him In The Right Path So That He Will Be A Great Leader Unto Us. After 12years of competing,congratulations to the incoming president. Congratulations sir. We pray your time bring us the much awaited change we seek.